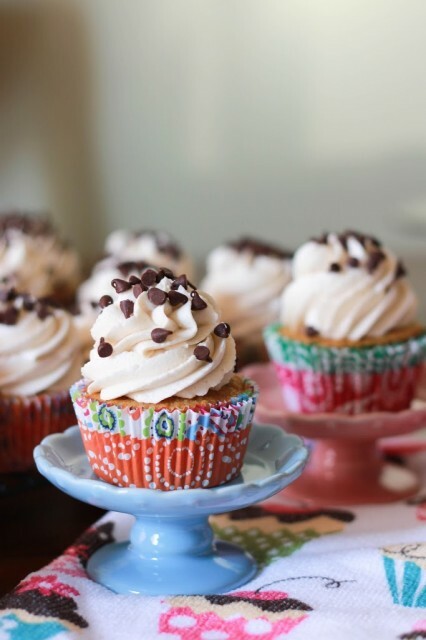 These cupcakes are like chocolate chip cookies in cupcake form. Not chocolate chip cookie dough but baked chocolate chip cookies. I’ve made cookie dough cupcakes before and knew that I wanted this cupcake to be completely different. I thought about starting with a classic yellow or vanilla cake with chocolate chips, but I ended up making a brown sugar cupcake with miniature chocolate chips and I’m so glad I did. I loved the subtle brown sugar flavor and the miniature chocolate chips were the perfect size. After some debate, I topped them with a brown sugar buttercream. Again, the brown sugar flavor was subtle (only 3 tbsp of brown sugar) but it really took the frosting to the next level – yum! They’re rich, but not too rich and really do have the same flavor profile as a chocolate chip cookie – classically delicious =). They were a hit with Jordan’s co-workers and I’ll definitely be making them again. If you like chocolate chip cookies (and really, who doesn’t?? ), then you should definitely try this recipe. Enjoy! 1. Preheat oven to 350 degrees and line muffin cups with paper liners. 2. Beat butter on high until soft, about 30 seconds. Add sugar and continue to beat on medium-high until light and fluffy, about 3 minutes. Add eggs one at a time, beating for 30 seconds after each. 3. Whisk together flour, baking powder, baking soda, and salt in a bowl. In a separate bowl or measuring cup, whisk together milk and vanilla. 4. On low speed add flour and milk alternately to the butter/sugar mixture, beginning and ending with flour mixture. Fold in chocolate chips. Scoop into prepared liners using a #20 scoop. Bake for 18-22 minutes. Makes 18-20 cupcakes. 1. In bowl of stand mixer with paddle attachment beat butter on medium-high speed until very light and fluffy, about 3 minutes. Add brown sugar and continue to beat until sugar has dissolved, about 2-3 minutes more. 2. Gradually beat in powder sugar. Add vanilla and milk and continue to beat until light and fluffy. Pipe onto cooled cupcakes and garnish with miniature chocolate chips, if desired.